Looking for dog friends bars in san diego California ? — — USE PROMO CODE “NOCTURNALSD” for discount ticket pricing . Go to our Bark And Brews Discount Promo Code FIRESIDE Patio event . Come check out our san diego dog friendly backyard BBQ event The Barking Lot at the fireside patio . This event will be june 18th from 1 pm to 6 pm . We will have raffles, prizes, music, dog friendly for all breeds. Dog bars in San Diego promoting a pet friendly environment. Dog pet vendors farfetched apparel, paws play, nak snakcs, pawtopia dog training and more. Vegetarian options are available . Dog friendly bars san diego pet friendly events . Dog Friendly Venues San Diego event calendar june 18th 2016 . Dog Friendly Party Events San Diego Fire Side Patio Bar And Grill BBQ event . Dog Friendly Clubs San Diego events calendar 2016 . Dog Friendly restaurants List . Dog Friendly Calendar events meet ups for all breeds . Dog Meet up Groups singles couples play dates sponsors . Dog Meet up Singles Group San Diego . Dog Friendly Meetup Hashtags . 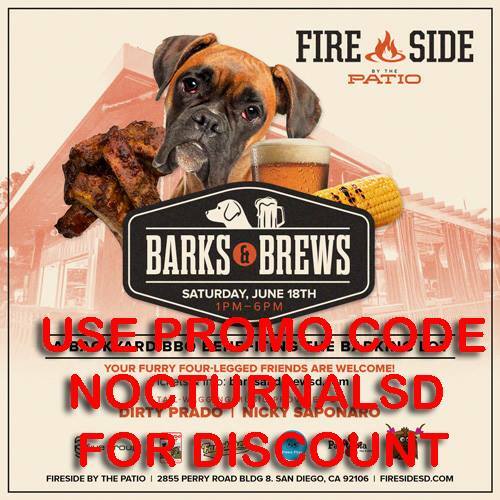 #barkandbrew #barkandbrewsd #bark&brewSD #dogfriendlysd #dogsofsandiego #dogmeetupsd #dogbarsd #dogeventssd #sandiegodogevents #sandiegodogmeetup #sandiegodogdays #petpartysd #petsd #nocturnalsd #averylimobroker #erikavery #averymg #5group #firesidesd #firesidepatiosd . If you are looking for something fun for you and your pet to do in San Diego come on out to this BBQ event at the fire side patio bar and grill . Use our discount promo code coupon to receive a reduced price in admission.